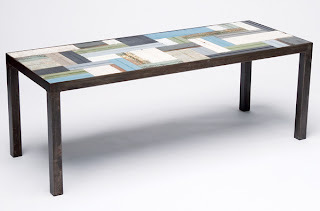 This colorful patchwork bench from Georgia-based artist Margret Taylor is made from reclaimed wood and doubles as a skinny coffee table--great for tiny apartments! Available in 5 colors, classic (shown here), harvest, natural, pastel, and whites. 47" x 18" x 17"